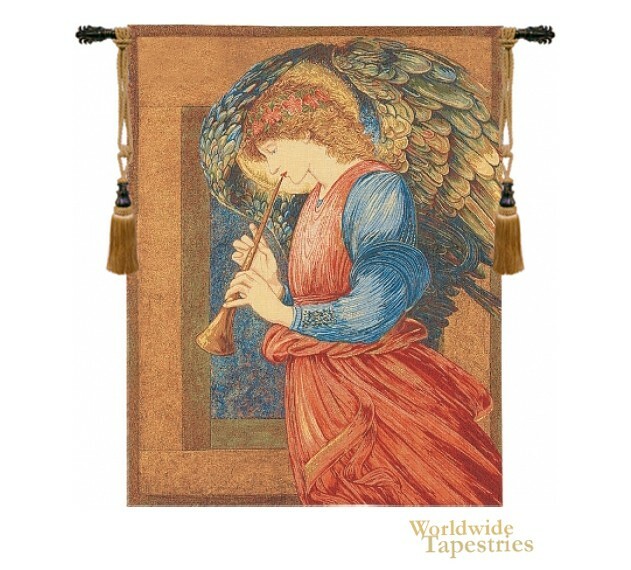 Originally painted by Sir Edward Burne-Jones (1833-1898), “Flageolet Angel” was inspired after art works of medieval period. Burne-Jones was fascinated with the restoration of the purity of medieval art, and later came to make his own works in his own distinct style during the Victorian era. “Flageolet Angel” was painted in 1878, about the middle of his career. It is a superb example of his work, which is characterized by an angel playing the flageolet. The detailed design and composition, evident in this piece, reflects his skills as a prolific illustrator and designer, as well as being a superb painter. A major force in Pre-Raphaelite art, Burne-Jones was a major influence in 19th century art in England and over Europe. This tapestry is lined and comes with a tunnel for hanging. Note: tapestry rod and tassels, where pictured, are purchased separately. Dimensions: W 27" x H 35"